New to you a year ago Oct 13 => Has it stood the test of time? Grimwold's new-to-you geeklists are the highlight of my month on the 'geek. They motivate me to review the new games I've played (and recycle my entries as comments), and they allow me to read the thoughts of some of the most insightful BGGers on new and classic games. But the new-to-me list is inevitably full of first impressions. I'm interested in hearing how those games that seemed so great at the time stood up to multiple plays. Did you actually play them that much after the first month? Did a game you dismissed at the time turn out to be better in retrospect? Add an entry with the same game you chose for the New To You Oct 12 geeklist. Link to your entry in that geeklist, then write down your thoughts on the game you chose a year on. If your impression of some of the other games you wrote up that month have changed, let us know about that too. 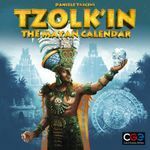 The hot game that month was Tzolk'in: the Mayan Calendar - has it stood the test of time? I'll be starting these lists mid-month, so we don't have to keep up with this list and Grimwold's (and several other monthly ones) all at the same time. You can subscribe to the announcement thread for reminders. 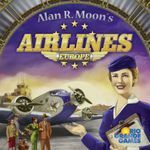 Item for Geeklist "New to you October 2012 => Best new boardgame"
Last October saw my first Essen followed by a London on Board away weekend. I played 30 new games, leading me to comment "New-to-you a year ago is going to be fun!" And here we are... I've made it a bit easier for myself by only replaying 7 of the 30 (and nothing I rated 6 or below at the time), but what a fantastic crop those were! Love Letter - now played 89 times, never skipping a month and becoming my #4 most played game. As my wife remarked the other day, "This just never gets old!". 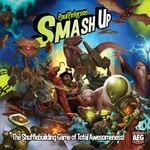 An utterly delightful filler that has proved just as fun with hardened gamers and neophytes. 9->9, but it might be time I bump it it to a 10. Strange entry. Three games to blabber about this month, though I have nothing especially intelligent to say about any of them. 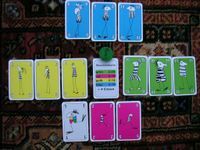 ...and I've played exactly one game of it on orderofthehammer, the one from last October, against 3 Geekbuddies/GCLers. I recall I came in fourth (Martin can correct me if I'm wrong; he won). It hasn't gotten so much as a nibble from among my local players, and among turn-based online/PBEM games I was strongly preferring 18xx and Tigris & Euphrates here at BGG at the time. So it kind of fizzled. Now that T&E is no more, who knows? Maybe I'll play a bit of Brass if I can find some non-sharks, people who want to talk through the game in the comments window rather than play in laser-focused silence and scoff at teh newbz (do the kids say that these days?). But it's a game I want to like, and remains a game I want to play a few times to see if it can have some staying power. Of course, to have Staying Power, something first needs Arrival Power. So, one problem at a time, please. Verdict: Brass has not stood the test of time, and that's somewhat annoying. 18AL is a PnP "one state" distillation of 1830, and my single play of it last year was 4p through Rails/Dropbox. As soon as I finished my game, I immediately hit the brakes on my PnP efforts, as it's just not that great and I don't see myself ever playing it in person unless something Very Bad has happened to most 18xx games in my gaming circle. 1830-ish 18xx games don't really work for me in under 4 hours or so, and very few "compact" games are terribly interesting. 1889 is much better as a smaller 18xx, and I'd even play 18FL over 18AL. It's not that aggressive, I don't care for the privates, and I'd never request it. Maybe as a teaching game, but only if 1889 isn't around. Verdict: has not stood the test of time, which is not that upsetting. Race for the Galaxy is a game I own, and have played quite a bit against Keldon's AI. I have to confess I have not yet played my physical copy, and I have not yet played against the Gathering Storm "robot," which is the predominant reason I bought it in the first place. I'm torn about it. It's fun to play, but I don't think playing electronically is a good way to learn the game (things happen in the AI mode that I incorrectly predict, or misunderstand), and I just kind of echolocate at times, which makes the gameplay mindless and not focused. I suspect that with a dedicated teacher, I'd pick up the game in about 90 minutes after 4-5 games, but on the computer, by myself, I'll get the same learning in about 25 plays after a lot of unsupervised trial and error. I'm not in a rush, but I can't even pretend to know what good strategies are in this one. I once tied the AI robot by doing a Produce/ConsumeX2 thing, but don't ask me how to replicate it. I love games with parasitism, and the whole leaching aspect of RftG is very attractive to me. Verdict: I have no idea what to say here. I guess it's stood the test of time in that I play the game over lunch sometimes, but I still have not played in person, can't drum up any real interest in it among my local players, and have not even tried to learn the robot. There are only two games I have replayed since (and except from Manhattan I don't even own the rest). Qin is one I really like. Yes, it's simple, yes, it's short, yes, luck does play a role in the game (although to a lesser extent than it seems first) but I like it - it's tense and tricky and it has even grown on me more since. 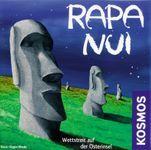 I think it's my favorite Knizia published more or less recently. I'm already at 14 plays and hope to get the new Qin: Toad and Dragon Turtle Game Boards from Essen. 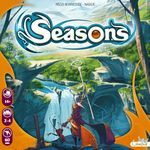 Seasons is a bit the opposite - I still like it but by the third time I played I started to be slightly bored. Some cards seem a bit overpowered while the innovative part of the game - how seasons work - is far less important than the M:tG-inspired card play. For me: definitely! We played 7 more times since last year, and I already preordered the upcoming expansion. Copycat got 4 more plays. It's a nice game, but it does feel more like it's only one path to victory. OddVille also got 4 more plays. Pretty good for a game we only picked up because we played a game while waiting to get an explanation of Asgard. Karnag got 1 more play. I still think it's a good game, but it's not one that we pick easily for some reason. Trans-Siberian didn't get any more plays, we did pick up some new cubes to replace the ones that weren't clear in our opinion, but somehow this is another game that doesn't get picked. Di Renjie and Basilica didn't get played again either. Yggdrasil: Asgard got 1 more play with the added rules, we've played the new gods more often. We don't add it when we play with new people, and we've tried Yggdrasil with newbies mostly in the last year. Also, we don't think the trance works very well with just two players, so when it's just me and hubby, we don't use that either. These were all games we got at Essen, and I think we did pretty well on picking games we like and get played again. The next ones we didn't get, but played either at Essen or because our friends did get a copy. We didn't play Among the Stars again. I would if someone really wanted to, but I won't request it (I haven't in the last year). I did ask to try Robinson Crusoe: Adventures on the Cursed Island again, and we did. We played the first scenario again, and lost horribly (again). Still it's a fun game, and I wouldn't mind playing again (and winning - winning would also be nice...). I don't really remember what Oh no... INVASION!!! was all about to be honest, so I guess it's a good thing we don't have it. Steel Driver - I played it 2-3 times in quick succession last year, but have not since. I want to play as I was intrigued by the game (and liked the quick play time), but my group wasn't very taken with the game. And it's really 2 games in one. That crazy chaotic endgame is interesting, but some find it off-putting. So, has it stood the test of time? I dunno, but I want to play it more. Dark Moon - I don't enjoy Battlestar Galactica: The Board Game so no surprise I didn't like this. My friends who do like the full BSG game also did not like this little dude. Strasbourg - One of those games where your first play is all about discovering all kinds of mistakes. It takes a 2nd play to know how to plan ahead. But I was not inspired to go for that 2nd play. It was typical Feld for me: soulless cube-pushing. 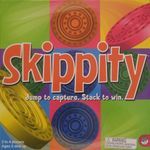 Here is my original entry to the geeklist: Item for Geeklist "New to you October 2012 => Best new boardgame"
Skippity (Played 1 time since October 2012) - I think this game has earned its place in my collection. Which sounds weird since I've only played it twice. However it has been enjoyable both times, and it is quick to teach and easy to play. I still find it lacks any real strategy, but the tactical decisions are worthwhile. It will never become one of my Top 10 games, but I know what to expect when I bring it to the table and it does deliver. Plus my mother-in-law loved it, so I think I will always have an available opponent. I love almost all games, play Boardgames with my wife, have three kids, generally enjoy cats and understand and like those bumper stickers with the little fishies sprouting legs. This happy cat is excited about new board games! I mention in last year's entry that its a rough month to get new games in... and this month is trying to shape up that way as well. Too bad I have so many new to me games rolling in. Its depressing to leave them sitting there unplayed! 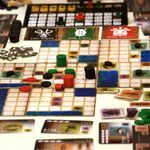 As I excitedly pore through the list of games expected at this year’s Essen, this Geeklist takes me back to the same time last year – when I’d just returned from my first trip to the amazing event. I’d played more than 20 ‘new to me’ games that month – so here we go again! Snowdonia duly arrived and has been played a plenty, with 14 recorded plays including some testing of the upcoming expansion, Mt Washington. I’m still loving it and looking forward to adding lots of goodies to the box this Essen. I still find it both imaginative and rewarding, which is testament to the variety it offers in every play. There was no need for the throwing of toys, as Tzolk’in did indeed arrive in my Christmas stocking. I’ve enjoyed 8 plays of it since and it has become one of my favourite euro games. I’m still rubbish at it though, which means I’m sure I’ll still be struggling to master the timing of it for years to come. And my big buy of Essen, Copycat, was another big hit; I still can’t believe it only cost 25 euros, especially seeing the price of it here now. It has seen 10 plays to date and has been a hit with most people I’ve played it with, and meaning I haven’t had to delve any deeper into the bag of Dominion wannabies. My purchases of Love Letter (9 plays), The Boss (4 plays), The Scepter of Zavandor (5 plays) and Leaping Lemmings (4 plays) all proved to be solid ones and each fills a hole in my collection nicely. I’m as surprised as anyone that I haven’t played either Coup or Galaxy Trucker since Essen. I don’t feel the need to own the former and can’t afford the latter, but it’s to my eternal shame that I haven’t managed to get it on a game of either for a whole year. I must try harder, as they’re both wonderful. I haven’t played either Glen More or Egizia in person since, but continue to enjoy both of them regularly on Yucata.de. Ticket to Ride USA: 1910 has seen very little table time, but mainly because the people we play vanilla TtR with most have been largely out of gaming circulation for much of the year. I have enjoyed infrequent plays of both Infinite City (4 plays) and AstroNuts (3 plays), which I’m still happy to own, but they rarely get any table time – simply because there are so many games ahead of them. Rumble in the Dungeon and Gloria Picktoria were both fun at the time but haven’t seen another play. Brawling Barons (3 plays) and Le Venise Du Nord (5 plays), for various reasons, have all fallen out of favour and while I’d be happy to play any of them they’re unlikely to get requested by me. I’m sure they’re devastated. Pfft to the rest, including Seasons. Oddly I fell out of love with it without actually playing it again; the more I thought about it, the more I decided it was too much of a luck fest and that it simply wouldn’t get played if I bought it. I haven’t seen it played anywhere since either, so until I do it’s off the radar. Legend = passed the test of time, = status remains unclear, can go either way; = no further hands planned, failed the test of time. Usually October would also include the shitload of titles from Spiel, but in 2012 I updated everything in November owing to a lengthy vacation thereafter. Doesn't really matter, but in case you were wondering why there aren't any Spiel novelties... now you know. Yes, I know I can antedate plays. I didn't want to bother with the 30+ items. Koekie Loeren — Disarmingly cute game of touching cookies reminiscent of Hive. Although there is a charming story attached to the earthenware cookies, I'm afraid the game itself isn't that tasty. It relies too much on the other player making a mistake instead of rewarding personal incentives. I'll stick to Hive. Bermuda Triangle — Horrible game from the dawn of time when roll and move was all that publishers put out. Cute idea of the thundercloud picking up player pieces, though. Colossal Arena — Bluffing games are not my forte. And so Colossal Arena is out. I will say that I remain curious to this day whether the apparent randomness in this game is mitigated in a clever Knizian way. Not that it will entice me play this game in the future, though. Power Grid: Brazil/Spain & Portugal — The Spain/Portugal-side of this Power Grid expansion hit the table for the first time. It proved to be a boring variation, similar to the older Power Grid maps which just changed the plant arrival rules a little bit. I can't believe I spent good money on this map: Friese doesn't appear to have Wallace's (Alpach's, Viard's, ...) talent for creating worthwhile expansions. Not going to play this map ever again if I have any say in it. And that's all folks! Nothing lasting for October 2012, I'm afraid. My list from a year ago is a bunch of games I haven't played since. I turned down the opportunity to play Masters of Commerce once or twice, but that's the closest I came. In my GeekList entry last year, I also made note of the Enhanced Edition of Sentinels of the Multiverse, but that has since been merged into the same entry as the original edition, so it's not noteworthy any more. I also noted my first play of my own Unpublished Prototype design. I have played it several times since last year, but not really enough and the design has languished in recent months. One of these days I'll sit down and polish it up. I tried this game years ago and not got very far. Admittedly it was with a group that were more interested in socialising than gaming (and there's nothing wrong with that) where no-one had read the rules and no-one really wanted to take charge of explaining and running the game and it all petered out as interest waned. As such, I was a bit wary when my regular lunch-time gaming partner suggested that we try it; he'd recently picked it up with a gift certificate and was keen to give it a crack. Anyway, memories of it all being a bit crap (I remember being on the wrong end of the assassin's dagger most turns) were put aside and we played a two-player game of Citadels. I was pleasantly surprised by how the two player game worked. Quite an elegant design and role choosing mechanism where bluffs and counter-bluffs are vital to fox your opponent and get your Citadel built. We just used the basic set of cards, but with a few more games under our belts we'll try the advanced/expansion cards and see how it works for us. Overall, I enjoyed the game a lot more than I expected (perhaps proving my memory isn't what it used to be) and look forward to trying this one again soon and regularly. The lesson that it may be wise to give a game that didn’t impress at first another chance has not been lost on me*. * Except for RoboRally and Power Grid, I have no desire to ever try either of those two games again. Well, in the last 12 months I have played a few more games of Citadels and, generally speaking , enjoyed them; possibly enjoying it more with two players than with six players. I have played them both with my lunchtime games group as well as a couple of other more social games groups and while not being a 'first choice' or 'go to' game for me I would probably not refuse a game under most circumstances. As I know plenty of people who have the game I do not see any necessity in picking up a copy for myself. I still stand by my assertion that RoboRally and Power Grid are poo. A year ago this month, I'd played five new games and a couple new expansions. As usual, I'll list the games in decreasing order of current enthusiasm, listing the games before the expansions. Still very (very!) enthusiastic about this title. I think it's a spectacular design: short; straightforward; and yet still brain-meltingly subtle. (Cool enough that I may even lobby to play it tonight, though it might still lose out to Princes of the Renaissance there.) This is one I expect to be playing at least a few times in the next several years. My rating is no longer quite as high as provided by my first play. In some ways, it reflects the feeling I had on playing 1960 after Twilight Struggle: I like the latter better. This one, too - and despite the resonates-completely-with-me cold war theme - is one that I find lives in the (substantial) shadow of the older sibling. I'd just prefer to play Twilight Struggle given the opportunity. "None since" here isn't quite due to lack of opportunity (I think I could have managed to play one or two more times) but more due to lack of time. My first play took 9 hours. And I don't have many 9h game slots in my life any more. The game was compellingly interesting, though. Were I to have an appropriately-sized chunk of free time (and the Excellent Opponents to make it worthwhile) I'd definitely be up for playing again. The "none since" is due primarily to lack of opportunity: I don't own this one. Admittedly, I wasn't motivated to buy it; so that's partly my fault. But, equally, I'd be happy to play were it to make an appearance again. The Tightest right-left binding award I'd given it last year worries me a bit in retrospect, but not enough to make me decline a game. While I have played Power Grid a couple times in the past year, I've not used either the Québec or Baden-Württemberg mapboard. Happy to have it in the collection; I'm sure it'll (eventually) be played again. Sadly, neither of my youngsters has been tempted by this one. And while it amuses me, it's not something I still think we need to own. We'll see whether it survives the next year. Thanks again to my youngsters, the BAP attenders, the back-on-Friday Lunch folk, and the Wednesday Night gang for some great game experiences. Well, although october scores always ridiculously high in 'new-to-me' thanks to Spiel I haven't played Tzolkin yet. My geekbuddies tell me I probably don't really miss anything on it and I guess they're right after reading enough about it. If you like the pictures, do the owners a favor and thumb them. Snowdonia is a great game. I'll gladly pick up some expansions this year, despite that I only played it 5 times in total. For me 5 times a year is quite a lot, since I own hundreds of games that all want attention. There's nothing really new about it, but it just works great together in a nice thematic way. And I like that it scales well, it even works with 2, so after a year I'd probably say it was a good choice for 'new game of the month'. 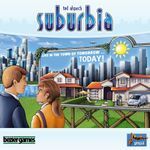 The other contender was Suburbia, which I even managed to play 8 times in a year. Again nothing really special, but I really like the way the game thematically clicks together: what the tiles do makes sense to me, and I like that there is actually more interaction between players than seems obvious at first glance. It works with two, but I do prefer it a lot more with 3 or 4 players since the tiles that bring out more interaction aren't so good with 2. I guess I should look at the new expansion as well. 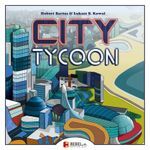 I played City Tycoon as well in the same month, but I don't own it, so haven't played it again. And since I have Suburbia I don't really feel the need to get it. Would gladly play again though. Myrmes was another game I liked. Although I don't own it I managed to play it again and liked my 2nd session as well. I'm usually not so fond of worker placing games, but since it's quite a tight game, with some possible direct confrontation it felt different enough. And I like the little ants. It's currently on my 'might pick it up if found for a good deal'list. Which is a kinda long list, but you never know. Of the 'filler' category Martian Dice really hit the spot with a lot of (casual) gamer friends. I guess it's the way the dice look. Even my little son loves it. Which is the reason it got a whopping 28 plays in a year. That's actually a bit too much for me for such a light lucky dice game filler with only a hint of control, so I only bring it out when asked. Hanabi is different and fun enough to be a good filler. Although it's literally a sort of "multiplayer solitaire" (in getting the cards in the right order) it's amazing how much fun it is. With only 5 plays down I'll probably be ready for quite some more plays the coming years. 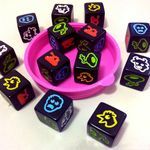 Pick-a-pig is probably a game most 'serious' gamers will disapprove off, since it's in the same vein as speed games like Set or Jungle Speed. But it charmed me from first play. Also 8 plays. I'll be getting the Polar Bear version at Essen as well methinks. I like a good dexterity game. Riff Raff is not as good as PitchCar or Crokinole, but it's quite a lot of fun. All 5 sessions were a hoot. And despite it's a bit of a pain to put it together for a session the look af that rockin' boat alone makes it worth it. 5 sessions in and still not bored. Unfortunately I haven't played Love Letter again, but I definitely want to play it again, it's high on my shopping list. I haven't played Regents again. I thought it was nice enough, but not really special enough. So it might end up on the trade pile. And I guess I'm one of the few people that aren't 'blown away' by Terra Mystica. I even played it again because so many of my gaming buddies like it, and I think I should really like it as well, but it just won't click with me. It ain't bad, but.... I think the mechanisms are just mechanisms, the theme isn't really there. I think the rondelthingy for those white cubes doesn't really make sense. I just don't understand all the fuzz about it. 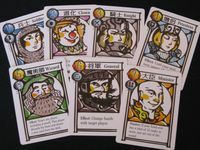 Di Renjie is a card deduction game that feels quite original. But it only got played again with 2. Which also didn't feel like a good player amount for it, just like 6. I guess 3 or 4 will be the sweet spot. If not it will be on the trade pile. I'd like to point out to potential Spiel visitors to take a look at Höchste Eisenbahn if you play with kids. It's a fairly simple card game, but it has a couple of different ways to play it, so you can make it harder for you (as an adult), to make it more interesting to play with kids. This small card game is dirt cheap, and it proved very handy while waiting in restaurants on dinner with our 5 year old. I probably played it more than the 4 times I've registered it. I can't understand why people actually like Tokaido, to me it just looks great. Maybe that's why I disliked it instantly: a game looking so good should at least be a fairly good game instead of an autoplaying bore. Luna should have been the last new Feld I played. I currently don't want to play any Feld games anymore if it's longer than 60 minutes. I think they're all pretty bland soulless boring cubepushers. 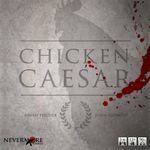 This has gotten 14 plays total in a year. 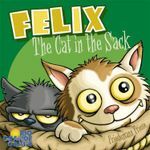 It is quite an accessible Feld as I have managed to teach this to my daughter and even my 10 year old son, as well as my wife. It is also well accepted by the gals at my FLGS. This will get more plays for sure, time willing. Played 12 times already, this has gotten a recent upsurge after it was very warmly received by the guys of my Warhammer 40,000 group. 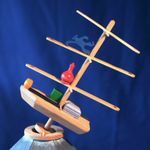 The fact that it has surprisingly VERY smart and competitive play and that it scales very well up to 6 players has undoubtedly accounted for the enthusiastic response. This clever game of dice manipulation and area control has been played 11 times since I got it. 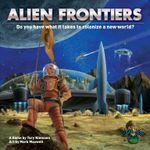 My rating has gone down slightly due to the open information on the scoring track, but maybe it will go up again once my order of the expansions arrive. This has been played 10 times, which is surprisingly low since you would think a game like this would get much more plays. I think the reason is that this is a game which is not really a gateway game, yet also not really a "gamer's" game. This means it is not as accessible for new people, and yet is also not a filler game on a gaming session. I do like it as a 2-3 player game, but I always houserule that the number of bases = number of players (minimum of 3 bases), and sometimes I lower the winning score to 12 instead of 15 in case time is lacking. Played 8 times, initial plays of this were headache inducing for me and the gals at the FLGS. However, I have grown to appreciate it during subsequent plays, mainly because there are several paths to victory which have yet to be explored. I plan to teach this to the 40K gang, who I hope can appreciate this game. Well Titan was 32 years old by the time I first played it, so I guess I don't have much say on if it has stood the test of time. Kinda speaks for itself. But I personally give it a . Played several more times since last October: a few solo learners, taught 2 friends (separately) in abbreviated games, and finally played a full epic 2P clash that took 6 hours. Would love to play it again, but that play time makes it difficult to get on the table. I like the tenseness of this game. I really do feel like I'm on the verge of dying on the mountain. That said, many people in my group don't like the stress of trying not to die, so this doesn't hit the table as often as I would like. I do try to bring this out as a sort of gateway, as the gameplay isn't that hard to grasp and it's about an hour. But I definitely need to play this more, I still haven't regularly done the hard side or winter weather yet! The only thing is I don't really like how the end-game strategy is to do a suicidal ascent. It's not very thematic, but I guess some people have tried to come up with variants around this. This game did not really click with me in the first few plays and I traded it away pretty quickly. I can't really pick out exactly what I didn't like about it though. The gameplay just felt underwhelming and sometimes it dragged on. Unfortunately we haven't played this game again since we tried it a year ago. I keep sticking it in the game bag but for some reason it's just getting passed over for other games. I shall persist! I liked it enough to want to play it again. 1812: Invasion of Canada was my one and only new game last year. I played 7 times last October and two times since; I was pretty enamored with it until just tonight when I finally got to try 1775: Rebellion. 1775 is very much like 1812 with a couple of small changes that improve the experience quite a lot - the biggest change being that it's a 4-player game now. 2 vs 2 is less swingy than 3 vs 2. Anyhow, 1812 is still wonderful for 5 players (if a little unbalanced). SET continued to see play through the end of 2012, but not much since then. It's a fine game of its type, and I'd be willing to play it again, but I'm unlikely to suggest it. I'd rather play something that mixes in some other mechanisms with the visual sorting challenge, and maybe even a little theme, like in The Stars Are Right. As expected, I haven't played Lines of Action since last year's post, even though I find it to be a highly interesting abstract. Again, consistent with expectations, Pirateer still comes out for play, very infrequently. It's been a long while since adding new cards could make Call of Cthulhu: The Card Game seem "new to me." I do continue to acquire expansions, though, and it has the most plays logged over the last year out of any of my games (narrowly beating out Hive). Android: Netrunner was easily the best game I played for the first time this month. 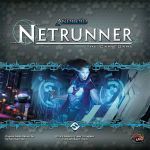 Most of these games were using out of the box runners or corporations that provide nicely balanced games for those that don't want to delve into the deck-building aspects that Netrunner offers. Last years sentiments seem understated. In the eleven months plus since last October ended, I've played 85 games of Netrunner. I'm no where close to being tired of the game. In many ways, I feel like I'm just scratching the surface. The beautiful thing about the living card game format, is that the game keeps changing and evolving. With new cards your local group, or meta, changes and evolves as well. ANR is just starting it's second cycle of data pack, or mini-expansions. This game has the legs to grow and be enjoyable for years. Game of the year, 2012. Le Havre Oh boy. This was my first "heavy" game and my first Uwe game besides Bohnanza and it was also the most I had spent on a game up to this point. I was completely enamored of this game from the start and it remains one of my favorites. Luckily, Le Havre is also one of my wife's favorite games and we really enjoy playing against each other. 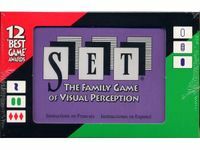 Sadly, due to length and complexity, this game doesn't come out as often as I would like, but I always push for it whenever there are three of us playing. My copy came with the Le Havre: Le Grand Hameau expansion and I even had an instagram buddy send me some other promo cards. I am almost certainly going to buy Bremerhaven just because it looks like Le Havre. I really like Le Havre. Seasons I bought Seasons on the same day as Le Havre and played it for the first time after playing my first short game of Le Havre. I loved the artwork, I loved rolling the dice, and I just thought it was a cool game. Unfortunately, my group did not agree. I brought this one out 3 or 4 more times, but I just couldn't get anyone else on board. I honestly think it just comes down to the variable card powers and how you can just end up getting beat down by another player. 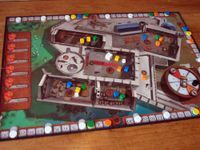 I traded away my copy of this game, but I still manage to play on Boardgamearena.com from time to time. King of Tokyo I like monster yahtzee and would play it if the guy who owned it would show up to game night more often. I don't feel as though I need to own my own copy, though. Elder Sign I liked this ok, but haven't played the physical version since. I will bust out the iphone version from time to time while waiting for things or on the bus. Pandemic Up until this point, I was feeling pretty ambivalent about co-op games. I figured that I should play Pandemic once or twice as it was one of the best regarded co-op games out there. I was fairly dissatisfied with the Pandemic games I played and was mostly just happy that they didn't take very long. These days, it would take some serious persuasion to get me to play a co-op at game night. Gloom My first storytelling game! I had an awesome time playing this but couldn't help feel as though the card game was getting in the way of the fun. I haven't played since, but there are a few of us who swear that we'll get some storytelling rpg's going soon. I like games. I like Calvin and Hobbes. Oh, but I like games more. 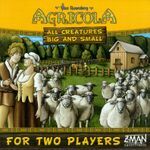 Last year in October was when I started tracking plays on BGG, and it's also the month that my wife bought me (us) a copy of Agricola: All Creatures Big and Small. At $40 or so, it really felt overpriced for such a small game, but it sure is a lot of fun. Our history with Agricola had a rocky start, since I knew the game before my wife learned it and I wasn't as "kind" to her as I probably should have been as she started learning it. However, thanks to this little two-player and her perseverance in learning the "regular" Agricola, we are now fans of both games. Usually, ACBS is our go-to game when we want to experience that painful worker-placement agony on a short time-frame. And I think we're almost down to $1.82 per play, which makes the game feel a lot less expensive. We've also nabbed a copy of the first expansion, which really helps add variety. Lots of fun... still a favorite! I rated them 7,7, and 5. Hell of Stalingrad had some interesting ideas, but it did not take long to realize it was a lot of maneuvering for what amounted to probably a dice off of 3 dice to 2. The Fires of Midway had similar ideas, but it was a series of dice-offs, so it did not come down to a single lucky roll. So while the ideas were interesting, the end result was not. But this game was my first exposure to Stalingrad, so when I traded for Storm Over Stalingrad, I knew what to look for and appreciated that game more. Plus one of the BGG users pointed me to SoS after seeing I was playing this one. I ended up trading this for Guns of August (Worthington, not the Avalon Hill classic). Interestingly enough, I traded back for my copy of GoA that I had traded a couple of years ago. Phantom Leader was good, but I also bought Hornet Leader at the same time. Both are good, but too much alike. I am keeping Hornet and trading Phantom. Most interesting is No Retreat, I said that I thought it looked like a really good game, but I couldn't grok it. I played as the Russians and got owned when I wrote this. I added the comment, "come back in a year, and I bet No Retreat is the best game of this month. There is so much going for it, that I can't give up on it, whereas I would have given up on lesser games by now. I keep thinking I am that close to breaking through. Stay tuned." The answer was no. I played as the Germans and got owned. I just never could figure this game out. I couldn't figure out the strategy. I couldn't figure out the rules and their many exceptions. Even more funny is that I teach others how to play Empire of the Sun, which is an incredibly complicated game, but I just never could figure this one out. I still say it's probably really good. All of those wargamers can't be wrong and it did win a bunch of awards, but it just wasn't a game for me. I have tried to raise awareness to fellow wargamers to quit recommending it as a beginner wargame. It has a 24 page rule book chalked full of exceptions. It is NOT a beginner wargame, and I hate to see new wargamers get burned on our genre because they took advice from some grog who has no problems with such rulebooks. Anyway, after turning down numerous trade offers because I had my sights set on trying to land Commands & Colors: Ancients, I gave up and traded it for War of the Ring (First Edition) and then traded for C&C:A the next day. So overall, I played 3 games and traded 2 and am trying to trade the third. Not a good month. I said last year that although I had 5 new games to me this month, I wouldn't rush to play any of them again. I put my favourite adult game, Airlines Europe, as the list item last year, but said at the time that I probably enjoyed Enchanted Forest most, and it was the only one that's had any repeat plays. This had been lingering in a cupboard for ages before we played it last year, and was an instant hit - even the youngest, then 2, was able to participate (although with telling everyone where things were!). It came out several times over the Christmas holidays, then once each holiday since. Not a real favourite, but one they always enjoy when they do pull it out. They were all ok, but nothing special, and not enough to make me want to actively seek out chances to play again. The last was the only one we owned, as a sweetener in a MathTrade, and we sold it on - too similar to Chrononauts, which we already own.